THENNAKOON BANDARA - Monaragala Daily News Corr. Information and Communication Technology enhances the quality of teaching and learning. It has become part of every day life in the modern society, said Wildlife Conservation Minister Vijith Vijamuni Soysa. 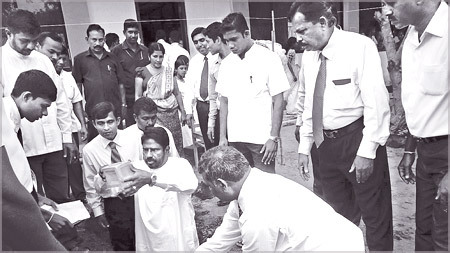 The minister was speaking at the foundation laying ceremony for Mahindodaya Technology Centre at Mariarawa Maha Vidyalaya in the Madulla Educational Division recently. The minister said the government takes measures to open up educational avenues for rural schools to pave the way for the students to keep pace with the new trends of technology. Teachers and students should possess ICT knowledge and English language to achieve millennium goals of education. The minister appreciated the Mahindodaya concept which comes under the 1,000 school improvement project. He urged teachers, students, officials and parents to extend their support to make the project a success. The minister said "it is high time we all united together sans discrimination as terrorism put to an end and we should contribute to win the hearts of others as the Western forces make false allegations towards the government." The Economic Development Ministry has allocated Rs. eight million for the project. Madulla PS chairman Chaminda Puspakumara, Madulla Divisional Secretary R.M.Rasika Thilakarathna, Bibile Zonal Education Director, Madulla Divisional Education Director Nalika Karunathilaka, Principal D. M. Thilakarathna and other government officials also participated.